The Onassis Foundation USA is committed to the promotion of Greek Culture. The Onassis Cultural Center in New York City furthers that mission by offering programs and exhibits to the public free of charge. The Art Wall in the Cultural Center atrium displays specially commissioned pieces by contemporary international artists. Also on display in the atrium are a collection of Parthenon Marble Casts, on loan from the City College of New York where they were used in art classes for more than 100 years. The Onassis Foundation funded the restoration of the casts. The gallery at the Onassis Cultural Center features art exhibitions with works ranging from the ancient to the contemporary. See images from past and upcoming exhibitions at the Onassis Foundation’s website. Events at the Cultural Center include concerts, readings, lectures, films, and theatrical performances. All events are free but some require registration in advance. See a list of upcoming events. View comments from visitors to the Onassis Cultural Center. The atrium is open daily from 8:00 a.m. to 10:00 p.m.. Gallery hours vary by exhibition. Please visit the Onassis Cultural Center website for details regarding hours of operation. 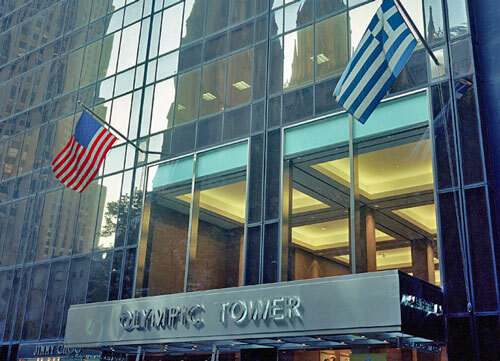 The Onassis Cultural Center New York is located in the Olympic Tower at 645 Fifth Avenue, between 51st and 52nd Streets (there are entrances on both streets). The street address is 645 5th Avenue.